Note: We are greatly indebted to many brethren in Canada, U.S.A. and overseas for the information which appears in the TIDINGS section each month. We deeply appreciate their kind help and assistance. As a guide to all who submit obituaries, the optimum length for an obituary is 70 to 100 words. Longer obituaries must be edited due to space limitations. Our deadline is the 8th of the previous month. There are months when all our allotted space is filled prior to the deadline, so to ensure inclusion of your news items, please forward as soon as possible. Vancouver, On August 18, a young Malaysian student was baptized at West Richmond. The following week a fellow student professed to be saved as a result of an outreach of the assembly. Gaius Goff and Bryan Funston expected to commence gospel meetings at Carlton on October 20. At the Pacific National Exhibition, many packets of literature were distributed. This is the 25th year for the P.N.E. work. Calgary, The West Hillhurst assembly enjoyed ministry during September from John Grant and Sam Jennings. Several young saints have recently been baptized. Follow up work from an extensive Seed Sowers distribution during the summer is now being carried out. Saskatoon, James Webb and Roy Weber expected to start a gospel series on October 20. Taylorside, The saints enjoyed recent visits from James Ronald Sr., Robert Boyle and Robert Neill (South Africa). Arnstein, On August 25, the saints were cheered when three believers obeyed the Lord in the waters of baptism. At the September conference, the ministry was uplifting and a very nice spirit prevailed. Eighteen of the Lord’s servants were present to help. Barrie, Helped by Allan LeBlanc (Bolton), Timothy Walker had two weeks of gospel tent meetings with children’s meetings in the morning. Outsiders attended almost every night and over 40 children attended in the morning. Chatham, Recent visits by Jack Nesbitt, George Patterson and Lorne Mitchell were appreciated and helpful. Embro, Lorne Langfeld expected to have children’s meetings in October. Goodwood, During September, Lorne Langfeld gave help at fall fairs, including the Niagara Regional Exhibition, the International Plowing Match and the Woodstock Wood Show. Hamilton, The assembly had appreciated visits from P. Simms, A. Kluge, M. Derksen, D. Oliver and U. Ussher. London, Two believers obeyed the Lord in baptism in September and William Lavery was present for this happy occasion. Manitoulin Island, Alvin Cook and Bert Snippe closed the summer tent effort with two weeks in Gore Bay. Blessing in salvation and restoration were seen as well as many contacts made. A testimony to the Lord’s name has been established at Manitowaning, on the east side of Manitoulin Island. Alvin Cook and 12 believers broke bread for the first time there on October 6. Newbury, Helped initially by David Cooper and later by Timothy Walker, James Beattie had four weeks of encouraging gospel meetings with three souls professing salvation. Sault Ste. Marie, The Labour Day weekend conference was very profitable with eight of the Lord’s servants present. Bible readings on Witnessing and Discipling were very practical. In May, Eric Parmenter ministered the Word for one week on future events. During August, short visits by Robert Boyle and Murray McLeod were enjoyed. Sudbury, The saints enjoyed visits from Ken Moore, Peter Simms and Bruce Rodgers during August and September. Toronto, There was an excellent gospel spirit as 13 assemblies united for a three week gospel series by Marvin Derksen and David Oliver in a suburban high school. Large numbers of strangers attended and the Lord blessed in the salvation of souls. One week prior to this series, there was a baptism at Unionville, with one saved the following day. Also, one week before the meetings started, there was a baptism at Brock Avenue with one soul professing the next day. St. Donat, Leslie Wells and Ivan Poirier had three weeks of tent meetings. The attendance was not large, but the effort was encouraging as unsaved relatives of a couple in fellowship came and brought others with them. Bathurst, In August, Leslie Wells and Ivan Poirier had the first tent meetings ever attempted by assembly workers in this locality. A few heard the gospel for the first time. Pigeon Hill, In July, Leslie Wells had five helpful ministry meetings. Quisparnsis, Larry Steers was with Murray McCandless for the last two weeks of a tent effort, and two souls professed. Barrington Passage, As a follow-up to well attended meetings that Ken Taylor and James McClelland had in this location in June, Albert Hull and James McClelland had further tent meetings in September. Clementsvale, The recent conference was well attended and the ministry was constructive and timely. River Hebert, The saints had appreciated visits by Ken Taylor in August and September. David Hunt had a week of well attended children’s meetings from September 22-27 and remained for the following Lord’s day. Arlington, Twelve of the Lord’s servants and a good number of believers attended the annual conference held over the Labour Day weekend. A nice spirit prevailed throughout, and the saints were edified and encouraged. Brother Gooding remained for four nights of profitable ministry from Acts 2. Albuquerque, William Lavery expects to have ministry meetings from November 17-24. Cedar Falls, Dr. David Vallance had a seminar on Creation on September 7. Garnavillo, The saints had the joy of seeing 10 baptized on September 15, and Robert Orr and James Smith were with the assembly for this happy event. Hitesville, The September conference was well attended with a good number of the Lord’s servants ministering the Word. The Bible reading on 1 Cor. 11 was appreciated by many. After the conference, Andrew Bergsma gave helpful ministry in a number of area assemblies. Fred Krauss visited prior to the Manchester conference. West Union, Cod blessed in salvation during gospel meetings by Alan Davidson and Eric McCullough. Alpena, On September 29, Joel Portman and Ro Weber started a series in the gospel. Ontario, The saints had appreciated visits in September from John Norris, Robert Orr, Robert Neill and Robert Boyle. On September 15, George Patterson and William Skates were with the assembly for the baptism of three young believers. Jackson, Two weeks of children’s meetings by Gary Sharp were well attended and many of the older children showed a genuine interest in salvation. James Smith expected to have a week of ministry at the end of October. The assembly enjoyed a report meeting on the work in Chile by Andrew Kluge. Saginaw, John Slabaugh and John Dennison ministered the Word at the all day meeting on October 6. A baptism on the same day gave further encouragement to the saints. Akron, The assembly appreciated ministry from Larry Buote and William Lavery who visited during September. Also in September, a large number of Seed Sowers texts were distributed in a new area of Akron. Clyde, Helpful ministry was given by William Lavery, Andrew Bergsma and Joel Portman in their visits here. Mansfield, Joel Portman, Robert Surgenor and John Slabaugh were with the assembly for ministry in September. Monticello, Cleveland, On October 6, the assembly enjoyed a large all day meeting with Oswald MacLeod, William Lavery and local brethren ministering the Word. Prayer is requested for a gospel series which James Smith and John Slabaugh plan to commence on November 3. Toronto, Timothy Walker had two weeks of well attended children’s meetings recently. Hickory, Three weeks of tent meetings by Jonathan Procopio and David Petterson. (Hickory) closed on October 2. Barrington, Gospel meetings from September 11-29 by Dale Vitale resulted in much joy and blessing in salvation. The effort was supported by the saints of the Pennsauken assembly and both assemblies were encouraged and refreshed. Livingston, The saints enjoyed a visit by Oswald MacLeod on October 1. Special children’s meetings were planned for October 13 through November 10. Midland Park, The conference was well attended and very helpful ministry was given by Oswald MacLeod, Murray McCandless, Jonathan Procopio and John Stubbs. After the conference, brother Stubbs remained for two nights of encouraging ministry. Please pray for gospel meetings starting on November 10 with Albert Hull and Dale Vitale. Terryville, Two young men obeyed the Lord in baptism on September 15. 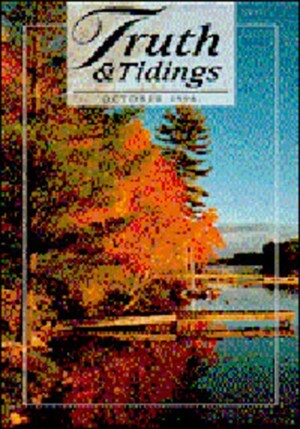 Methuen, On September 8, Frank Tornaquindici opened the first fall monthly Bible reading on 1 Peter 3. It was a profitable time and well attended. These readings will continue on the second Lord’s day of each month through the winter. John Stubbs was with the assembly for a night of ministry recently. James McClelland and Ken Taylor expected to start gospel meetings in the middle of October. Saugus, The assembly greatly appreciated ministry meetings in September by John Stubbs and Albert Hull. Hardwick, The conference was exceptionally well attended this year. Ministry was given by E. Badgley, L. Buote, W. Lavery, G. Roy, L. Steers and J. Stubbs. Augusta, The saints were encouraged with two nights of ministry by John Stubbs after the Hardwick conference. Ardmore, A large number attended the conference. Those taking part in ministry were U. Ussher, H. Paisley, J. Flynn, R. Cunningham and J. Wishart. Ballyclare, D. Kane and T. Meekin had very well attended tent meetings. Ballyhay, Good numbers attended and the Lord blessed in salvation during gospel meetings by J. Lennox and B. Currie. Bleary, There was some interest and one lady professed salvation during tent meetings by A. McShane and D. Gilliland. Cullybackey, W. Fenton and A. McLean are preaching the gospel in a portable hall. Currian, Profitable ministry was given at the well attended conference by T. Wright, J. Milne, J. Martin, B. Glendinning, B. Craig, R. Wilson and N. Tinsley. Kells, On a short visit to the province, Harold Paisley had very well attended gospel meetings with blessing in salvation. Our brother gave appreciated ministry in Dromore and Ballymena on Saturday nights. Killycuffagh, The Gospel Hall was filled to capacity for the conference and the Word was ministered by a number of brethren. Lessans, J.G. Hutchinson and S. Thompson had another two weeks in the gospel. Limavady, R. McKeown and M. Radcliffe commenced a series of gospel meetings. Martray, Tent meetings are being held by S. McBride and B. Glendinning. Moira, There is a good local interest in gospel meetings by S. Maze and R. Eadie. Newtownbreda, S. Ferguson and Jack Nesbitt have commenced in the gospel. Brother Nesbitt has given a number of interesting reports on the Lord’s work in St. Lucia. Concepcion, About 550 believers attended the conference on September 18 and 19. The ministry was good and the fellowship was much enjoyed. Corinth, St. David’s, Brian Owen expected to commence a gospel series on October 20. The assembly plans to have a conference on January 1. Brother Owen values prayer for the work on this island. Further gospel efforts are planned for Crochu, St. Andrew’s and Grand Bay, Carriacou. Jesse Fitch is in Tobolsk and helping the assembly in Kaskara, but has developed health problems. Earl Ritchie and George Osachoff (Surrey) were invited to Sakhalin Island and are working there. Tom Cooper (Jackson) is helping in the English school in Tyumen. Paul Wielenga and Louis Smith of Jackson visited the assemblies in Surgut and Kaskara, and are working in the Ural Mountains with the assembly in Severaulsk, preaching the gospel in that area. November 30 and December 1 in the Gospel Hall, Mountain Road. Meetings on Saturday and Lord’s day start at 10. Information: David MacDonald, phone (902) 756-2309 or John Bain (902) 625-2409. Accommodations: Ron Steffenson (902) 756-3019. January 11 and 12 in the Gospel Hall, 3516 Linden Avenue, with Prayer meeting on Friday at 7:30 p.m. On Saturday Bible reading at 10 on “What does Baptism and Reception into the Assembly mean?” Breaking of Bread at 10:30. Corr. John R Bell, M.D., 580 S. Reynolds Place, Anaheim, CA 92806, phone (714) 533-1247. Hall phone is (310) 424-6747. December 28 and 29 in the Gospel Hall, 4646 Twain Avenue, with meetings both days at 10, 2 and 7. Prayer meeting on December 27 at 7:30 p.m. Bible reading on 2 Cor. 5. Corr. William Smith, 5005 La Doma St., San Diego, CA 92115, phone (619) 582-2109. Hall phone is (619) 280-7021. January 1 in the Gospel Hall, RR, Aplington, IA, beginning at 10 a.m. Corr. Dr. Larry L. Brandt, 509 Lincoln St., Parkersburg, IA50665, phone (319) 346-1084. Hall phone is (319) 347-2333. November 28. All day meeting in the Gospel Hall. Ministry at 10 and 2 with Gospel at 7. Corr. Richard Stickfort, 515 4th Street, Box 313, Stout, IA 50673, phone (319) 346-1857 or Gary DeGroote, 28073 West Brook, New Hartford, IA 50660, phone (319) 983-2713. Hall phone is (319) 346-1153. January -1 and 5 in Haddonfield Middle School, Lincoln Ave. and Chestnut St, Haddonfield, Prayer meeting on Friday at 7:30 p,m. in the Gospel Hall, 6530 Carolina Ave. at Route 38 (near route 70), Corr. David A. Curran, 326 Windsor Ave., Haddonfield, NJ., 08033-1142, phone (609) 429-4443. School phone is (609) 429-9620 or 429-4175. Bertrand Howard of Charlton, Ontario on July 21, age 80. Our dear brother was born in England on October 5,1915 and came to Hamilton when he was four. He was saved at age 18 and was in assembly fellowship for 60 years. Brother Howard loved the assembly and helped in any way he could. After a lengthy illness, he passed peacefully into the Lord’s presence. He is survived by his wife Isla, two sons and one daughter. Remember them in prayer. Ernie Dellandrea spoke faithfully to a large crowd of family and friends at his funeral. Ben Goatley of Auckland, New Zealand on July 24. Our dear brother served the Lord for many years in Guatemala and more recently in El Salvador. He had planned to labour in Nicaragua and returned to New Zealand for a brief furlough, before moving to that needy land. While in New Zealand, he was diagnosed with a brain tumour. After enjoying several “good” months, Ben’s condition started to deteriorate and the last weeks, three of which he had to spend in hospital, were not easy for him. The last two days, he was in a coma. Continue to remember his wife Helen and his family in prayer. Clarence McCollum of Vancouver, B.C. on August 8, age 73, while on vacation in Scotland. Our dear brother was born in Warringstown, N. Ireland and was saved on March 23,1963 in Kitchener, ON after immigrating to Canada in 1957. He spent his initial years in the Kitchener assembly, and moved to Vancouver in 1967 where he was in happy fellowship in Woodland Drive until his passing. In 1976, he was predeceased by his first wife, Else. In 1980, he was married to his second wife, Margaret, with whom he faithfully served the assembly until his homecall. Miss Daphne King of Klang Malaysia on August 15. Daphne was saved at age seven and gave early indication of full dedication to the Lord. She was commended in 1950 by the Toowoomba, Australia assembly and served faithfully in Malaysia for over 45 years. A telegram from the elders of the Klang assembly stated that Daphne was the first Christian missionary in their village and said she was worth more to them than ten brothers. At the funeral in Toowoomba, Daphne’s devotion to the Lord, her outstanding courage and her self-effacing service were stressed. Joseph Camarra of Worcester, MA on August 25, age 85. Our beloved brother was saved in 1932 during meetings by John Dewhurst and Rocco Cappiello in Methuen. Soon he joined brother Cappiello in gospel work in Worcester. As a result, he moved to Worcester to form part of the assembly at its beginning. He and his wife lived for the assembly. “The day shall declare” their faithfulness to the Scriptures and their kindness to believers in their needs. Distant assemblies appreciated our brother’s occasional visits and help, as evidenced by some coming many miles to his funeral. Mrs. Fern Lindsay of Monrovia, CA on August 28, age 78. Our dear sister was born in Duluth, MN and was born again on March 1, 1972 in meetings by Harold Paisley. She and her husband David were in the Long Beach assembly for many years and spent the past two years in Monrovia. Mrs. Lindsay passed peacefully into the presence of the Lord after open heart surgery. She had a quiet disposition and will be missed by all. She is survived by her husband, two sons, a daughter-in-law, three grandchildren and other relatives. The funeral was shared by A. Thropay Sr. and C. Drewery. Vera Louise Ramsay of Charlottetown, P.E.I. on September 12, age 78. Our dear sister was saved on May 28,1963 when she was attending gospel meetings by Robert McIlwaine and the late John Kember. She was a friendly, courageous and steadfast Christian and will be missed in the assembly. Her funeral service was conducted by Peter Orasuk, Douglas MacLeod and Robert Ramsay. Mark Saumure of Welland, Ontario on September 17, age 19. Our young brother suffered intensely over the past year from cancer. He was awakened after the diagnosis of the disease and was saved on August 3, 1995. He earnestly wanted to please his Lord and was soon baptized and received into the assembly. Often from his wheelchair he would praise God with an appropriate hymn or prayer. He witnessed to many and his large funeral attested to the many he had encouraged and preached to. He is survived by his parents in the assembly in Welland and his sister in Toronto.